Shiden is the 17th master of the Mugen Tenshin Ninja Clan. Ayame is his wife, and Hayate and Kasumi are his two children. He banished his older brother Raidou from the Mugen Tenshin Village. 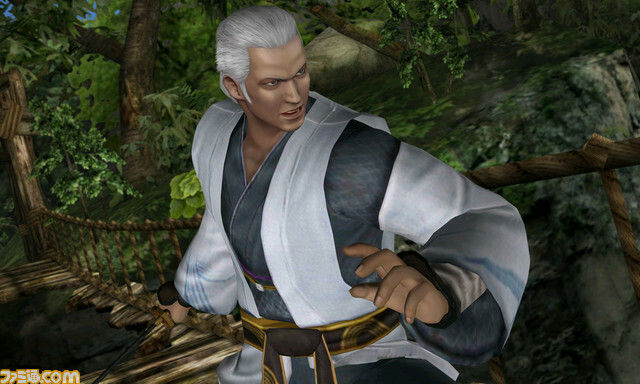 He is a hidden playable character in Dead or Alive: Dimensions. Shiden is a generic, yet somewhat cool design. He uses some of the same moves as Hayate & Kasumi, or at least moves that look pretty much the same. His DOA: Dimensions fighting style isn't bad overall... but in my opinion, some of his kicks are pretty ugly and have poor technique/animation, especially his air-throw combos. Meh.